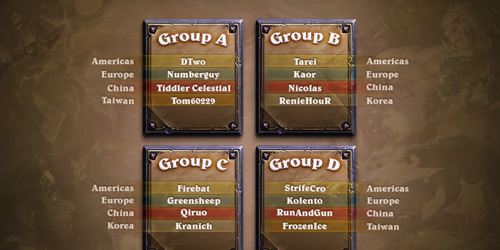 The Hearthstone World Championship Groups and Schedule! Take heart, young one, theHearthstone World Championship is near! Soon, 16 of the most skilled card-slingers from all over the world will gather together to duel for a treasure trove of $250,000. 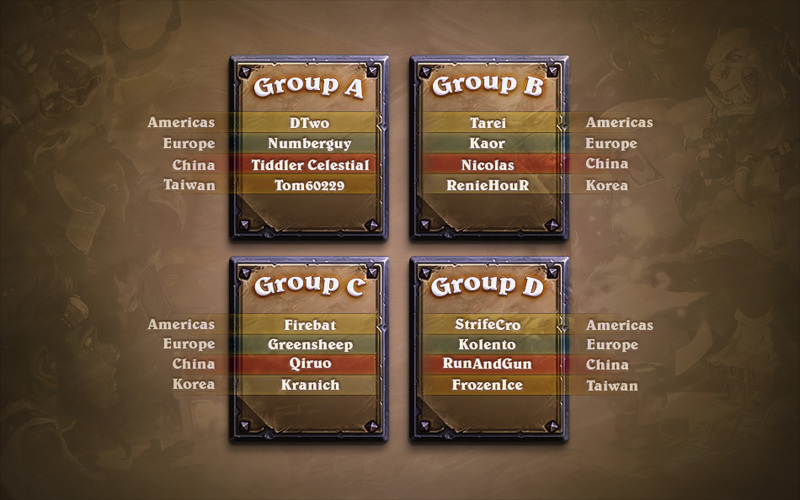 Players from the Americas, Europe, China, Korea, and Taiwan have been placed in four different groups, with each player vying for a spot within the Top 8 finalists! The Hearthstone World Championship begins on November 2nd and 3rd at 10:00 a.m. PST at ESL’s Burbank Studio. Community casters Dan “Artosis” Stemkoski, Dan “Frodan” Chou and Isaac “Azael” Cummings-Bentley will join Hearthstone balance designer Ryan “Realz” Masterson and Senior Game Designer Ben Brode in breaking down all of the card-slinging action live on the official PlayHearthstone Twitch. Americas Championship Host Rachel “Seltzer” Quirico will once more take up her microphone and interview the players as the matches unfold. We also have additional streams for those looking to watch the Hearthstone World Championship in other languages. The Road to BlizzCon concludes on November 7th and 8th at BlizzCon 2014, where the remaining 12 players will duel for a chance at Hearthstone glory. Hosts Marcus "djWheat" Graham and Rachel "Seltzer" Quirico will be on hand to interview players, while Marcin "Gnimsh" Filipowicz, Dan "Frodan" Chou, Jason "Amaz" Chan, Ryan "Realz" Masterson and Nathan "ThatsAdmirable" Zamora add insightful and entertaining commentary! Which two duelists do you have advancing from each group?